Like most Internet advertising, StumbleUpon’s advertising allows you to target those people most likely to respond to your product offering. You can set your Paid Discovery advertising campaign to target people based on their interests, their demographic information, or the device they are using. When you’re trying to reach a specific audience, you want to “target” the types of people you “believe” will interact with your advertising. This is really important in any type of marketing, since you don’t want the wrong types of people clicking on your content and then abandoning your website right away. For targeting criteria, one choice you have with StumbleUpon involves Interests Bundles, which are broad interest groups that match the psychograhics — the combination of user behaviors that make up a common profile — for each group that you want to reach. Essentially, StumbleUpon has enough information about these broad groups of users to know that they will interact with certain types of content. These users are more likely to click and share your Paid Discovery content. Your other choice is Precise Targeting, where you choose to target interests manually. It’s easiest to stick with the Interest Bundles targeting, as StumbleUpon’s advertising system is smart enough to make changes on the fly, rather than you going into the system every day. The manual process is better for more advanced users. To choose Interest Bundles, first click to select its radio button, then click to select one of the many options you havefor targeting. For example, if you’re promoting extreme sports content, you’d want to target adrenaline junkies. To choose multiple Interest Bundles, press the Ctrl key and click another Interest Bundle. 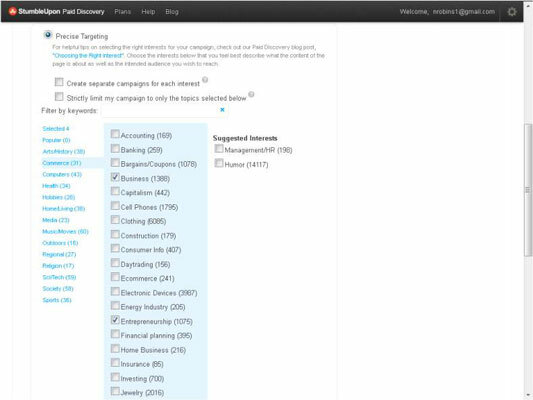 To choose your interest targets manually, click to select the Precise Targeting. Radio button. With this option, you have the opportunity to drill down into specific interests that your target audience will be most interested in. If you want to separate each precise interest into its own campaign, you do so by selecting the Create Separate Campaigns for Each Interest check box. This allows you to manually optimize each interest based on its performance. If you want to restrict targeting specifically to the interests chosen, select the Strictly Limit My Campaign to Only the Topics Selected Below check box. This controls your daily spend and targeting. If you don’t select this check box, StumbleUpon will serve your content to related and adjacent topics. Below, you can see how you can start out with a broader category and then drill down into specific topics. When you’re done editing your interest targeting, click the blue Save and Review button. 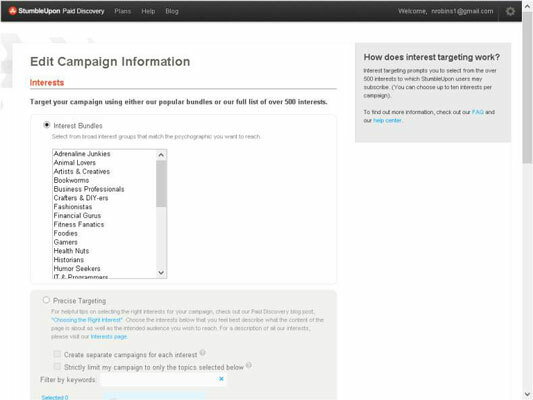 The next section of the Paid Discovery campaign setup process involves choosing your demographic and device targeting. By default, everything is set to Auto, meaning that the target demographics will be chosen by StumbleUpon based on who they think will interact with your adds. Consequently, you have less control over who you’re reaching and what devices — desktop computer internet browsers, mobile phones, or mobile tablets — your Paid Discovery appears on. You should go in manually and choose demographics and devices. To manually choose your demographics and devices, click Edit to the right of the Demographics & Device heading. On the next page, you’re greeted with the two main options: Auto or Manual. To manually choose your demographic and device targeting, click the Manual radio button. After you click the radio button, the background color will change from gray to white, which means that you’ll now be able to change the various settings. For age targeting, you see a scale with blue-and-white squares on both ends of the scale. To narrow the age range, click each box and drag until the age range changes to your desired targeting. For example, if you have a blog article about living with arthritis, you’d want to target people that are a little bit older. Whereas a blog post or video about Lady Gaga would probably skew to a much younger audience, say 20-somethings. Click the radio button that makes the most sense for your business goals and strategy. For example, if you’re a women’s fashion blog, you’ll probably want to target only women. If you’re a men’s ice hockey video site, you’re probably going to want to target men. Get the point? 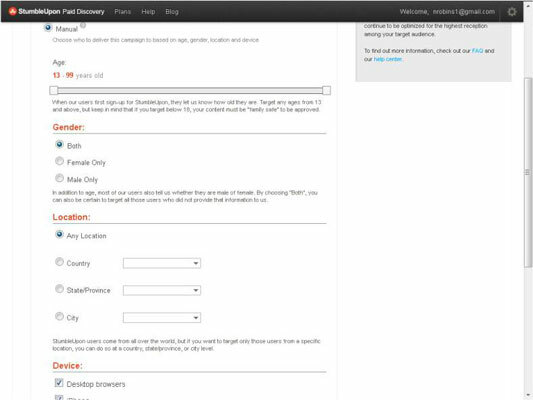 For location targeting, you have the choice of Any Location, or you can drill down to Country, State, or City. Select each check box for the device that makes sense for your business goals and strategy. If you’re happy with your demographic and device targeting choices, click the blue Save and Review button. With all this being said, you should stick with the Auto format if you’re a beginner. Then, as you become more familiar with Paid Discovery, you can choose your own interests and demographics.